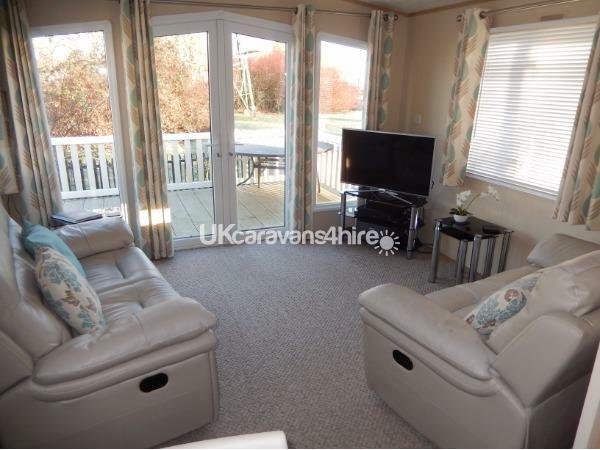 25% non refundable deposit balance due six weeks before arrival £100 security deposit payable with balance refunded once the home has been checked by our house keeper, usually returned within a week of your departure. There is a minimum of a three night stay, but between the beginning of November and the end of March the minimum stay is seven nights. 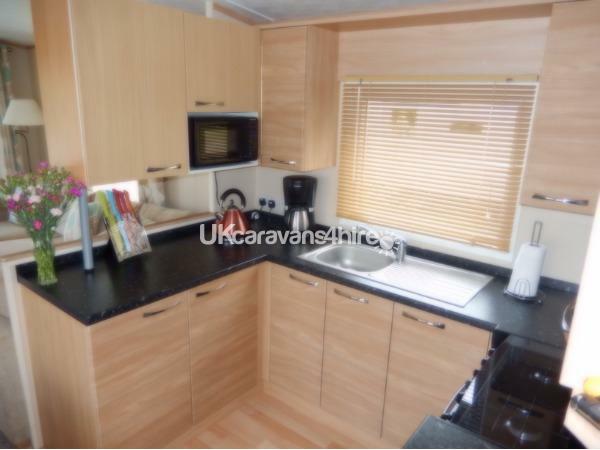 This luxury two bedroom mobile home offers all of the home comforts; full wi-fi, double glazing, central heating and a dishwasher. 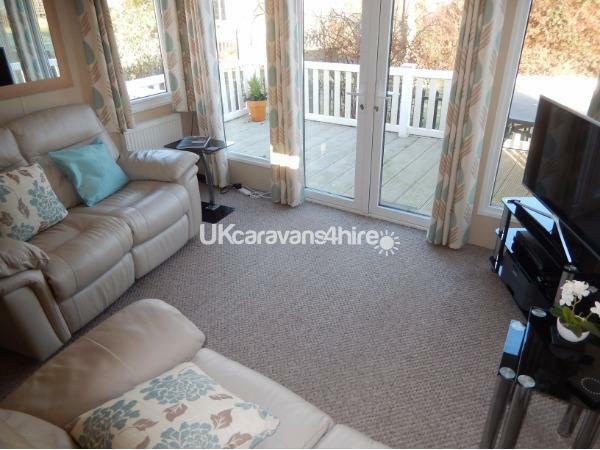 Two comfortable reclining sofas provide seating, we have a large screen Smart TV with Freeview and a Blue-ray player, CD, and an iPod dock. A recirculating fan for those hot days, a modern easy clean glass dining table, and more than enough crockery and cutlery. 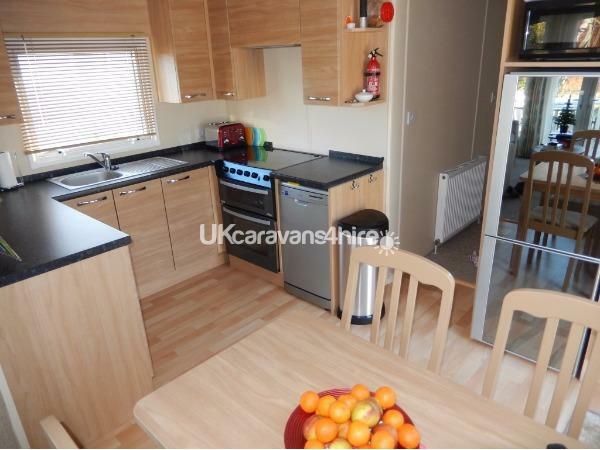 A deceptively large kitchen comes fully equipped with electric oven and hob, dishwasher, microwave, a large fridge/freezer, toaster, kettle, coffee machine, a George Foreman grill, all cooking utensils, crockery and glassware. Complete shower room with an unending supply of hot water, a w.c. and hand basin, and an en-suite with w.c. and vanity basin. 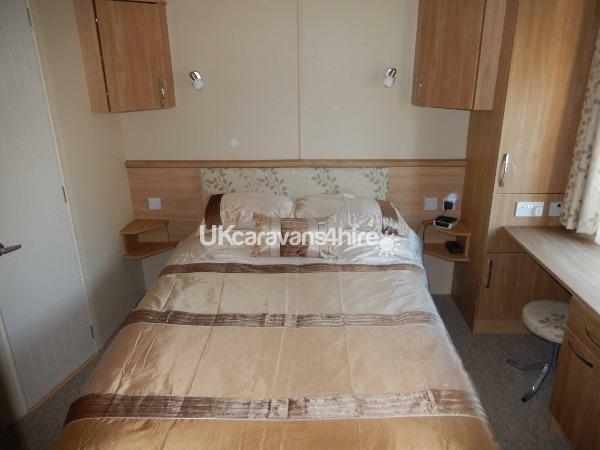 2nd bedroom with twin beds that can be put together as a double, storage and wardrobe. 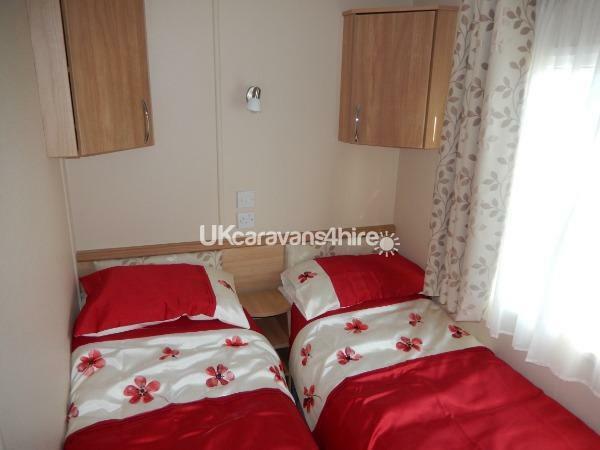 Bed linen and tea towels are provided, but please bring your own towels. 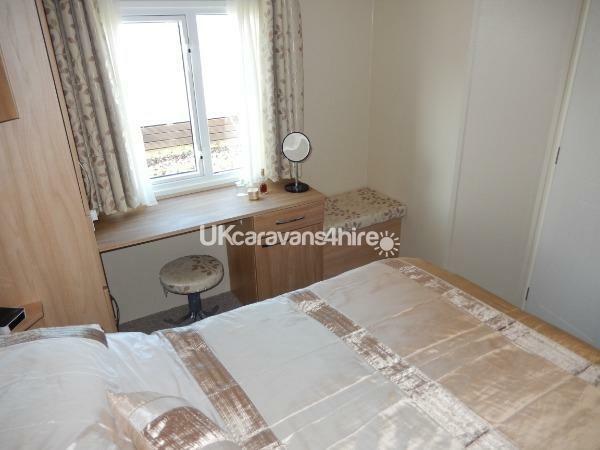 All windows have Venetian blinds or heavy curtains, including a roller blind over the entrance door. 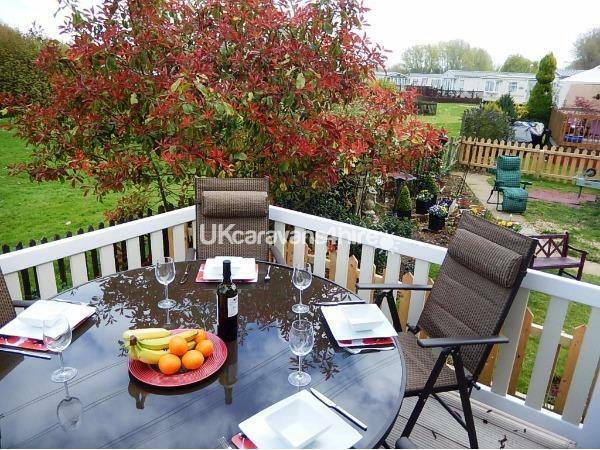 Our garden and decking area back onto the River Nene, with the Nene Valley walkway right beside us. Sit here with your favourite drink and watch the ducks, swans and narrow boats glide by.A large circular outdoor dining table and chairs to make the most of the weather, we also have a gate from our garden to a communal green area where you are able to watch your children play safely. Fancy some fishing? There several fishing lakes here at Billing containing; chub, roach, pike, carp and eel. 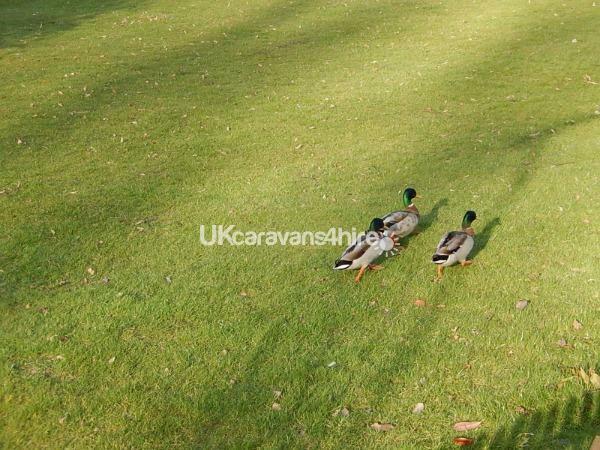 You may even have a visit from the families of swans, geese as well as other water fowl. Billing Aquadrome is wheelchair friendly, flat and level in most places, lots of green area's suitable for picnic's, however there is a flight of steps up to our front door. There are plenty of children's play areas are around the park. Restaurant, cafes and bars inside and outside the park, launderette, Go Karting, fun fair, large indoor leisure complex with indoor pool and water flume and child's play area, climbing wall, crazy golf, bike and boat hire and a miniature steam train to get you around. Chinese and Indian take-away's, local Fish and Chip Shop and several shops all go to make this on of the Countries favourite parks. Billing charge a key deposit which is refunded at the end of your stay. Additional Info: Indoor pool complex with water slides. A large well priced restaurant, with more in the immediate area including many take-aways. An onsite laundry should you need to use it. Several onsite shops.....no need to go up to the supermarket to 'top up'' there is a 24 hour Tesco just a few minutes drive. 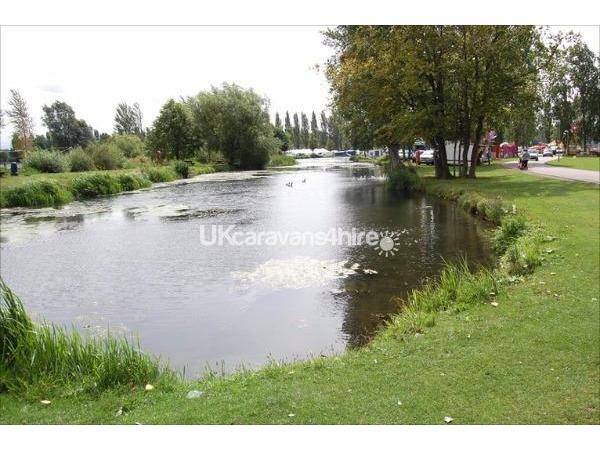 Several fishing lakes, and our mobile home backs on to the river. Hi Ali, We are pleased that you have taken the time to leave a review; and such a positive one. We tried to think of everything that would make an enjoyable and comfortable stay, ideally more than you were expecting. That is how we treat the villas in Spain that we rent out in southern Spain, just in case another time you want to holiday there, you can view them on: www.andalucianvillarentals.co.uk. You will be more than welcome back at Billing if you don't want to travel as far as Spain. Best wishes, Ian and Janet.